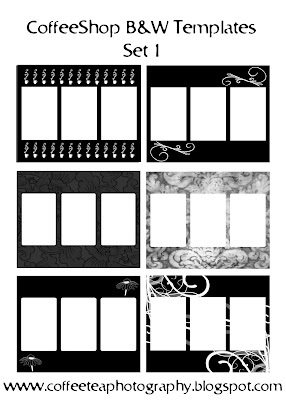 The CoffeeShop Blog: CoffeeShop B&W Templates! Here are the newest CoffeeShop Templates; CoffeeShop B&W, Set 1. There are 7 premade templates, all in one .psd file. They are 11x14, 300 dpi, with three 4x6 cutouts. This is not an action this time, but you just drag and drop your images into the template. When you open the .psd file in Photoshop or Photoshop Elements, you won't see any of the templates on your image. Simply look at your layers pane, and click on the eye icon of the template you wish to use. Only select one at a time! Then throw the others in the trash, add your images BELOW the template, free transform them to fit, and then flatten and save your template as a .jpg. Do do save as a .psd unless you rename it as you will lose the other template options. Download the CoffeeShop B&W Template Set 1 here! Thank you so much for the wonderful templates! These are so awesome!!! Thank you! Thank you! Thank you!!! Awesome! I can't wait to use them! Thanks again!!! I've been having so much fun with the other templates you posted, look forward to these as well. Thanks!! Thank you so much for both sets of templates you have posted. I downloaded them today and have just begun to play around with them. They are awesome, and I so appreciate your hard work on this!!! Thanks again! I love them. ?? where do I save this within my CS3 program.?? I have it currently in a folder I created. I keep all my adobe action and brushes downloads in it on my desktop. can i append it to my brushes or actions list or do i need to load it each time from my created folder. thankyou. they are just fantastic. Thank you for the great templates & tutorials. Thank you very much, these are beautiful! I am having trouble downloading the templates on my mac though...I've used one other one from your website and I see to remember it downloaded fine...am I doing something wrong? Thanks for the template. Wow...hope all is going well for you. Thank You! I love your work, you're super talented. Thank you so much for sharing your beautiful creation! You are very talented.